I got another holiday season appliqued shirt done. 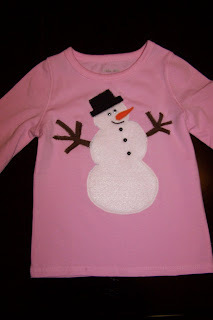 It is a snowman shirt that would be great to wear up until February. I can do these for $20 each up to size 5 T or $25 each for childrens sizes. If you'd like one please just give me a call or drop me an email at maddiemoosboutique07@yahoo.com. You can pick it up or I'm happy to ship it to you for an additional $2.00.